Minimum order with your imprint, 50. Quantity variation +/- 5% is possible & billable. NEW! Personal cooling fan for your cell phone. It has a Micro USB/Lightning Connector Combo (for use with either Android phones with OTG function, or Apple phones). Cell Phone Mini Fan to keep you cool where and when you need it. This portable high speed (16,000 rpm) micro motor helps to keep you cool. It's light enough and portable to easily carry around and have it available when you need it. The Apple adapter may be discarded if you use your fan on an Android phone. You may leave the adapter fully attached if you use your fan on an Apple iPhone. Everyone has a cell phone, and everyone likes to use their phone for everything. Camera, flashlight, phone, text-er, Facebook device, email device, internet browser, weather forecaster, calculator, calendar, datebook, watch, timer, alarm clock, address book, filing cabinet. Also we use the many apps that are available, to tune our musical instruments, navigate us to a destination, make a mobile hot spot for our tablet, write a memo, record audio, record a video, listen to the radio, watch TV, write music, read QR codes, translate other languages, read the bible, play music and show movies from YouTube, and now fan our faces to keep cool on a hot day. 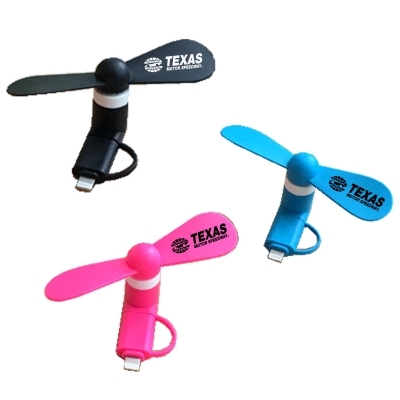 We can imprint your company and corporate logo on the fan blades or on the stem. It consumes very little power, 5 volts at 80 mA. It can run continuously for more than 100 hrs. Made of TPE material that is eco friendly. Price includes imprint in 1 or 2 standard colors or Pantone color, on one fan blade. Full color imprint is available at extra charge. Please furnish vector art made in Adobe Illustrator, or we can convert other art for a small charge. Product Size: 3 1/2" wingspan, 1 1/2" deep. Product Color: White, Pink, Black, Blue, Green, Orange. We can have custom color created for a minimum order of 5,000 pieces. Second imprint option: 0.6" w x 0.4" h on stem. Options: Imprint on both fan blades.